My name is Stephen Holcroft and I started Bluefish Computer Services in 2011. Based in Chichester Bluefish offers friendly, fast and reliable computer repair and maintenance services to small business and residential customers in and around West Sussex. I have been a computer engineer for 20 years. After leaving the University of Hertfordshire in 1998 with an HND in Business Information Technology I worked for various large corporate companies around the country looking after their I.T systems. In 2011, I took the decision to start Bluefish Computer Services and work for myself. I have helped thousands of residential customers from the young to the very elderly with all different levels of knowledge; I am CRB checked and a member of Trading Standards Buy with Confidence Scheme. I support all kinds of small businesses with their I.T systems including architects, opticians, solicitors, schools etc… I like to think I have a patient and personable approach and I will always take the time to explain and answer questions in a no-nonsense way. When I am not fixing computers, I enjoy sailing dinghies in Chichester Harbour with my family. 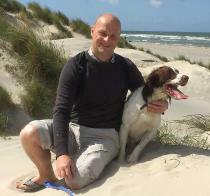 I also enjoy mountain biking on the South Downs, walking the dog on the beach and a spot of gardening. I am available 7 days a week from 08:00 to 20:00, on the phone 01243 216313 / 07858 035659 or by email [email protected] I would be happy for you to contact me to discuss your needs and arrange a visit to your home or work.